The Iowa Early Learning Standards 3rd edition is a new resource to achieve the Early Childhood Iowa vision of “Every child, beginning at birth, will be healthy and successful.” The quality of each child’s early experiences profoundly influences the foundation for future learning and success. The Iowa Early Learning Standards 3rd edition provides a common understanding for what young children should know and be able to do. The standards are the result of the dedicated work of 70 persons, including home childcare providers, childcare center staff, preschool - grade 12 educators and administrators, Area Education Agency professionals, parents and guardians, and state and national experts in early learning, health, mental health, nutrition, and home visitation and family support. This 3rd edition builds on the efforts of those who developed the 2006 and 2012 standards. It brings together standards and benchmarks for the age range of birth through the end of a child’s fifth year. It provides a continuum in developmentally and culturally appropriate standards. In addition, these standards are aligned with the Iowa CORE Standards for the end of kindergarten to support the transition from early childhood into the kindergarten - grade 12 setting. The standards include the most recent best practice and scientific research. We offer this tool to promote positive interactions and environments for young children. As a result of using these standards, Iowa will benefit for years to come. We invite all adults in Iowa to use the Iowa Early Learning Standards 3rd edition to support each child in Iowa to reach his or her full potential. Working together, we intentionally advance the well-being of our youngest children. Welcome to the Iowa Early Learning Standards 3rd edition. The Iowa Early Learning Standards (IELS) are for everyone who cares for, educates, and works with young children. The standards are a resource to support and enhance children’s learning and development. The standards are a tool to share information among families, caregivers, child care providers, family support, mental health, and health care professionals, teachers, program administrators, and others who care for or work with children during the first 2,000 days of life. Click on buttons below to download sections, posters, or benchmarks. The Cover presents the color coding used throughout the IELS. The IELS document is the product of Early Childhood Iowa. The Table of Contents provides a summary and page numbers for each of the eight Areas: Social and Emotional Development; Physical Well-Being and Motor Development; Approaches to Learning; Social Studies; Creative Arts; Communication, Language, and Literacy, Mathematics, and Science. The Invitation Letter encourages every adult in Iowa to learn more about the necessity for quality experiences during the first years of a child’s life and the impact of these experiences on future learning and success. The Iowa Early Learning Standards 3rd edition was approved by the Early Childhood Iowa State Board and the Iowa State Board of Education. The revision committee, representing individuals from every region of Iowa and from a variety of positions within early care and education, recognized the efforts of the 2006 and 2012 writing committees. A list of the 2006, 2012, and 2017 committees is included in the Iowa Early Learning Standards Writing and Revision Committees. The Introduction describes the intent of the IELS, the sections of the IELS document, the history of early learning standards in Iowa, revisions and updates to the 2012 version, and where to access the document online. The Essential Considerations explains the connection of the IELS to the principles contained in the Iowa Core Knowledge of Child Development, developed in 2016. Additional information includes the role of relationships in learning, the importance of physical and mental health, diversity and inclusion, the importance of play, the role of technology and interactive media, the role of observation and monitoring child’s development, and understanding school readiness. The Index provides a list of the standards for the age levels of infant and toddler (birth - 3 years) and preschool (3 - 5 years) in each of the eight Areas, and a list of the alignments of the IELS to the Iowa CORE and Iowa Fine Arts Standards. The Rationale provides details of why each standard is important for every child. This information provides a foundation for all adults to consider the impact of each standard. Research is noted throughout the Rationale section. This Standards, Benchmarks, Examples, and Adult Supports section offers each standard within the Area; and the benchmarks, examples of reaching a benchmark, and supports an adult can provide for a child to reach the benchmark. As with all sections in the IELS, color coding is provided for easy recognition of the Area, and if held in a fanned position, the color is viewed for easy access to the Area. In most cases, the infant and toddler standard and benchmarks are viewed at the top with a list of examples and a short list of potential support to provide for children to reach the benchmark. The lists are provided to encourage consideration of other examples and supports. The landscape format assists lesson plan development, and promotes conversations by the child care provider with supervisors, parents, and others. Throughout the IELS document, the lower left corner of every page identifies the section and page within the section, and the page number for the entire document is provided in the lower right corner of every page. It is critical that adults understand the IELS support the continuum of child development from birth through the end of the fifth year of a child’s life. The Iowa Early Learning Standards 3rd Edition and the Iowa CORE Alignment Overview explains the alignment between the IELS and the Iowa CORE Standards. The alignments connect the age-appropriate expectation for infants, toddlers, and preschool children to the knowledge children should master by the end of kindergarten. 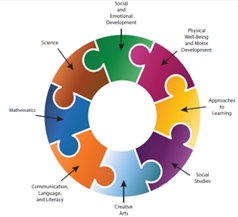 Alignments to the Iowa CORE include Social Studies, English Language Arts, Mathematics, and Science, as well as alignment to the Iowa Fine Arts Standards. The Standards for Mathematical Practices are also included in this section. IMPORTANT NOTE: The alignments do not show a one-to-one match of standards between the IELS 3rd edition and the Iowa CORE for kindergarten. Instead, the accumulating effect of what an infant/toddler learns creates the foundation, and then the preschooler’s learning builds upon that foundation. Ultimately, what a child discovers from birth to five years directly supports learning during the kindergarten year. Click to access the Iowa CORE and the Fine Arts Standards. The References section contains full citations to access the research, other publications, and identified best practice used to support development of the standards and benchmarks. The citations are presented for each Area and each age level standard, and the Essential Considerations. Iowa Early Learning Standards 3rd Edition Posters 11" x 17"